The Port of Galle is located on the South Western coast of Sri Lanka and is one of the oldest Sri Lankan commercial trading outposts. The port city of Galle bonds strongly with early European history of the Portuguese and Dutch enterprise of the pre-British era. Galle remains a popular passenger vessel excursion destination. 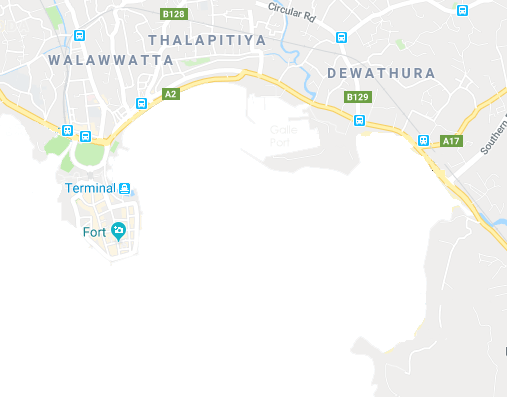 The port of Galle serves general cargo and bulk cargoes vessels with the infrastructure at Closenberg Jetty #1 Ship Length 130m X Draft 7.3m, Closenberg Jetty #2 Ship Length 130m X Draft 7.3m and the New Jetty having a total Quay Length of 162m X Draft 7.3m. The safe entry LOA to Galle is about 130m. In addition to the facilities for commercial vessels the port also has Marina Facilities for yachts. Under development (2018) is a Marina facility within the shelter of the breakwater. Galle is a well-known stop-over of various Round the World Races. Galle also serves vessels in transit calling off port limits for various services. Crew Changes, Technical Services, Ship Stores, Spares, Provision and Medical emergencies are some of the services which are is readily facilitated by a fleet of supply boats available on 24X7 basis. Mariners are alerted to the adverse sea conditions that may prevail off the Port of Galle during the South West Monsoon May to October.